In this page you can find the source code of Off-Spotter1. 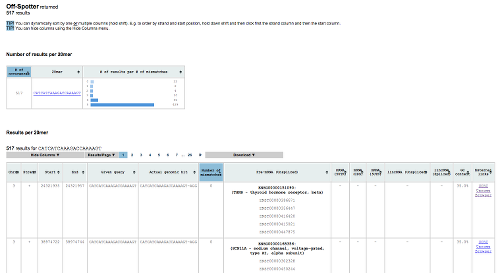 Off-Spotter is our new tool which identifies all genome hits of one or multiple gRNAs given in input and returns them to the user together with position, structure and annotation information. Off-Spotter is extremely fast and accurate. Off-Spotter is also very flexible. You can use your own genome data and any number of annotation files. Also it is set up to work for 4 PAM sequences, NGG, NAG, NNNNACA and NNGRRT (where R is A or G). Upon completion it returns the chromosome number, strand, starting position, ending position, the input gRNA, the hit, the PAM, the number of mismatches, and annotation information. Off-Spotter is also available as a web tool2. The web tool additionally provides numerous sorting and viewing options as well as statistic information for the hits. Click here to use our web tool. For more details on how to use the Off-Spotter web tool and source code please visit the Off-Spotter help page. This code (© 2015 Thomas Jefferson University, All Rights Reserved) was created by Venetia Pliatsika and Isidore Rigoutsos and is an implementation of the Off-Spotter algorithm that appears in Pliatsika, V, and Rigoutsos, I (2015) “Off-Spotter: very fast and exhaustive enumeration of genomic lookalikes for designing CRISPR/Cas guide RNAs” Biol. Direct 10(1):4. This code can be freely used for research, academic and other non-profit activities. TO BE OBTAINED FROM USE OF THE CODE. You can download the Off-Spotter source files as a single compressed file by clicking below. See the changelog here. You can also download this utility that enables you to submit data to Off-Spotter from your computer. Use this for automated queries, larger inputs, or several sequences. Please be mindful of the other users and submit a few different queries at the same time. You are visitor number 1433.